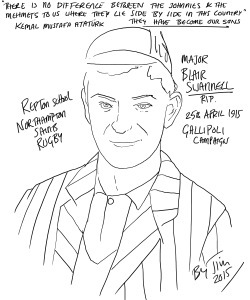 Today is Anzac day and a few years’ ago I was making a film about the Gallipoli landings in 1915, so it is very moving to watch the various ceremonies in the cemeteries on the Gallipoli peninsular and at the Cenotaph in Whitehall. 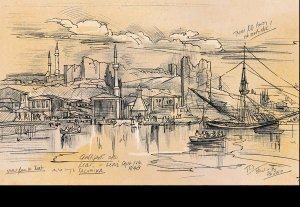 Here is a picture of the town of Gallipoli as it is today and my copy of the drawing made by Edward Lear in 1848 of the same view. The town was a major stop-off point for British ships on the way to the Crimean war. While the 1915 campaign is often thought to be an Australian and New Zealand tragedy, which it undoubtedly is, there was a huge contingent of Lancashire troops.